When the circuit has been isolated and tested we can get started. Loosen terminals 1 and 8. Remove the flex and the lamp holder to get them out of our way (you will need to unhook the ends of the flex from the retaining hooks on the ceiling rose base). Using an indelible marker pen, mark the end of the three live conductors. These are the ones in terminals 3, 4 and 5 as shown in Fig.1 above. Now loosen terminals 2, 3 and 9 then remove them from the terminal blocks. Now all the wires for the switch cable (cable C) are free. Now put a band of insulation tape around the end of the cable to identify it as the switch cable. (So, now the whole cable is clearly marked as the ‘switch cable’ by the tape and one of the cores will have marker pen on it to identify it as the live). Now loosen the remaining terminals and remove the remaining wires. Remove the two fixing screws from the ceiling rose and remove (take care not to push any of the cables up into the ceiling cavity). Pull the cables through the aperture in the new ceiling rose and fix it to the ceiling. Select the switch cable (the one you marked with insulating tape) and connect the live (the one you marked with the marker pen) to terminal 3. Connect the other wire to terminal 2, leaving the Earth unconnected. Select one of the remaining cables (either one) and connect the live (the one marked with the marker pen) to terminal 4. Now connect the neutral to terminal 6, leaving the Earth unconnected. 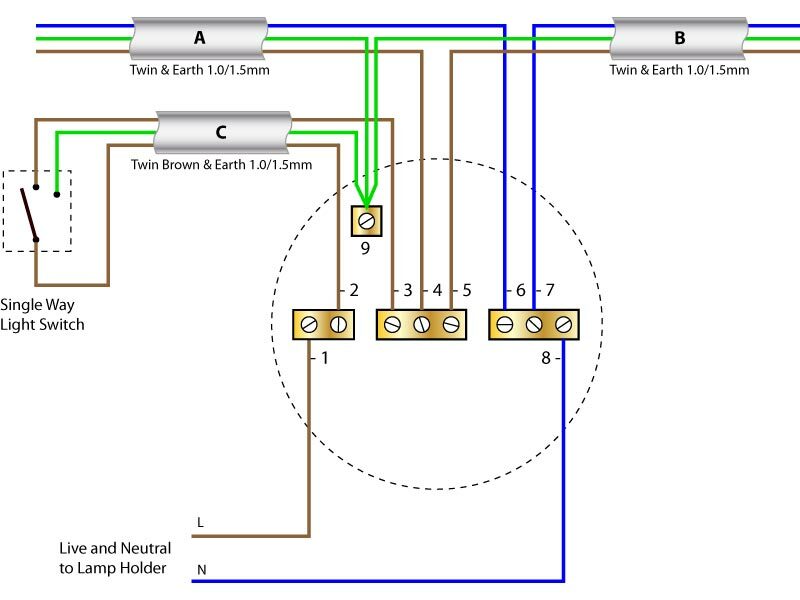 Select the last cable and connect the live (the one marked with the marker pen) to terminal 5 and the neutral to terminal 7. You now have the three unterminated Earth cables remaining. Ensure they are sheathed with Green/Yellow sleeving before connecting them all to terminal 9. Now reconnect the flex from the lamp holder to terminals 1 and 8. Loop each core of the flex around one of the retaining hooks on the ceiling rose. Refit the ceiling rose cover. Now replace the fuse / miniature circuit breaker, switch on the consumer unit main switch and check the light works. don’t forget to check other lights nearby are also working correctly as any errors made in reconnection may prevent them from working.